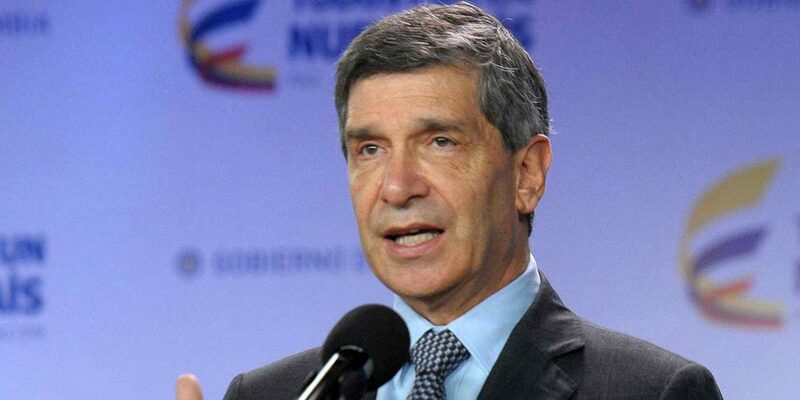 Rafael Pardo is a veteran Liberal Party politician, journalist and economist from Colombia who has spent more than 20 years in the public eye. While Pardo’s academic passions have always been in urban planning, economics, and local public policy, the professor arrived in the public sector at perhaps the most challenging time in Colombia’s history in a position normally occupied by a decorated general. Pardo grew up in a privileged household in Bogota, attending a private all boys high school and moving on to study economics in the prestigious Los Andes University. After graduating in 1977 and soon there after creating a program to support recently graduated economists, Pardo traveled to the Netherlands to study Urban and Regional Planning in the Hague’s Institute for Social Studies. He would ultimately return to become a professor and leading researcher at his first alma mater. A rising star in the world of academia, Pardo’s name became recognized in powerful circles in Colombia, which led to President Virgilio Barco calling upon the economist in 1986 to be the Director of the National Rehabilitation Plan: a social project with a focus on rural development. The targeted rural areas were specifically locations that had been affected the most by Colombia’s then 25 year old armed conflict. During these years, violence and unrest had reached an all time high in Colombia, with a guerrilla group seizing control of the Palace of Justice in 1985, the Patriotic Union (Union Patriotica-UP) and other leftist supporting political parties facing mass slaughter, and drug lords such as Pablo Escobar committing high profile assassinations while maintaining control over large parts of several of Colombia’s cities. Pardo proved his ability and loyalty however to the liberal President Barco and was named the Presidential Adviser for Peace in 1988. Pardo was put in charge of negotiating the peace process with several guerrilla groups such as the April of 19 Movement (M-19) and the Popular Liberation Army (EPL). Through this process, four guerrilla groups including the M-19 and the EPL demobilized and were partially reintegrated into society, a success for the government and for Pardo (Interestingly enough, Gustavo Petro, the mayor who Pardo replaced in 2014, was a former member of the M-19 guerrilla group). In 1990, the newly elected president, Cesar Gaviria –also a member of the Liberal Party– appointed Pardo to be Colombia’s National Security Advisor, which sealed Pardo’s fate as a political leader going forward. In 1991, with a newly reformed constitution for Colombia, Gaviria converted Pardo’s role into Defense Minister, making Pardo the first civilian to hold this position in decades. And there was possibly no worse job to have at this point in Colombia, namely because Pablo Escobar was still at large. Leading up to the 90s Pablo Escobar had ordered the assassinations of the expected president-to-be Luis Carlos Galan –for whom Gaviria was the chief of debate– Minister of Justice Rodrigo Lara, and countless army generals and policemen. Pardo’s public enemy number one coming into office was Escobar. The economist defense minister created the “Bloque de Busqueda,” or Search Block, a unit dedicated solely to combating drug lord Pablo Escobar’s Medellin cartel. At the finish of 1993, the reformed National Police found and killed the drug lord — while Pardo was in his post. By the end of Gaviria’s presidency in 1994, Pardo was looking for a change of pace and travelled to the United States to study international relations at Harvard. Once completing his work in the prestigious Cambridge, MA university, he used his connections and work with the former president to become an Advisor to the Secretary General of the Organization of American States (OAS) in Washington D.C. Here Pardo helped the OAS with ongoing peace talks in Guatamala, drawing on his experience from the early 90s. Finally in 1998, the academic-at-heart came back to Colombia to do what most politicians have done at some point in their career: enter into journalism. Pardo became a Night News Director for Colombian TV network RCN, and following his success there, moved on in 2000 to become the News Director at news station CM&. In 2002, Pardo was elected to Colombia’s Senate with Radical Change (Cambio Radical) political party. He and his party were large supporters of the then new president, Alvaro Uribe, and Pardo took a substantial role in crafting the “Justice and Peace Law,” which was implemented to aid in the demobilization of paramilitary groups such as the AUC. However Pardo soon stopped supporting Uribe and the Uribista coalition especially once the president began to seek a referendum to allow him to run for a second term — something that was prohibited by the 1991 constitution — and joined the party of the two presidents that he had worked for at the end of the 80s and early 90s, the Liberal Party. A year prior to the 2006 presidential elections (which Uribe would win), Pardo became a pre-candidate for the Liberal Party but lost in the primary to political powerhouse Horacio Serpa and did not end up running for Colombia’s highest office. Later in 2006, then Defense Minister Juan Manuel Santos accused Pardo of having ties to the rebel group the FARC, but the overseeing President Uribe retracted those comments after the fact. Finally approaching 2010 and the end of Uribe’s stay in the Casa de Nariño, the Liberal Party elected Rafael Pardo as their National Director and the politician announced his intention to run for the 2010 presidency. Here he was badly defeated by now President Juan Manuel Santos, arriving in sixth place with his running mate, the current mayor of Medellin, Anibal Gaviria. In 2011, President Santos appointed Pardo to be the Minister of Labor, perhaps a more fitting title for the economist and Urban Planning expert than Defense Minister from years before. The Liberal Party had become a strong supporter of President Santos at this point. Approaching the 2014 presidential elections, both the Liberal Party and the Radical Change party (the two Pardo had belonged to) had endorsed Santos’ reelection along with his own U Party (Partido de la U). Towards the end of March 2014, the mayor of Bogota, Gustavo Petro, was expelled from his position by the country’s Inspector General over a garbage collection mismanagement incident in 2012. Following the dismissal of Petro, President Santos named Pardo to be the interim mayor of Bogota, thus rebooting Pardo’s decade of failed political runs for Colombia’s highest office. Pardo’s stay lasted less than two weeks after the president was forced to reinstate the mayor whose impeachment he had signed off on only weeks before. When in 2014 mayoral elections were organized, Pardo announced to be aspiring the country’s second highest position in government, the Bogota Mayor’s Office, but lost again. Two weeks after the October 2015 elections, Santos named Pardo Post-Conflict minister, a post he held until 2018 when Santos lost office.